If you wanted to, you could accuse the 150cc segment of being the slowest moving segment in our market. But in the last few months, things have changed. There has been new products galore and today we have the best and newest and we intend to see if the newest is, now, the best or not. What's changed is that the new 150s aren't all 150s. TVS' RTR 160 was the first and Yamaha have had a 153cc 150 for a while. But the creep gathered momentum with the 155cc Gixxer and the 163cc Unicorn tipping the balance the other way. Rumour has it that a Pulsar 160 is now on its way. 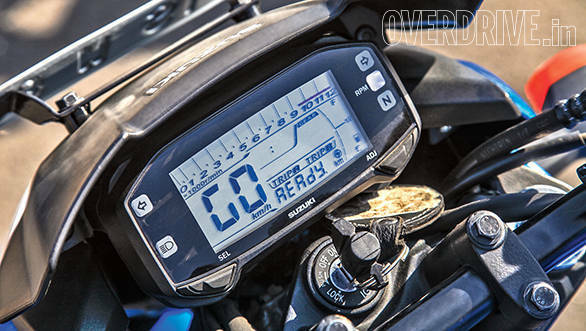 I cannot help but imagine that someone at Yamaha may be kicking himself for scaling the FZ back to 149cc. But that's another story, let's stick to this one. How do you appeal to everyone? It's a fine balance between being likeable and inoffensive. The problem with that is that you either get spectacular results or you become anonymous. That's the challenge for the Unicorn, which wants to be all things to everyone. But, is it? It looks quite a bit fresher from most angles. To start from the rear, I love the H-shaped tail lamps. I also like the overall stance of the bike. But while the Honda CX01 Concept from the Auto Expo was a full-on head turner, the new Unicorn, when you look at it up close, looks fussy and not striking. A whole bunch of textures and panels make up the side view. The plastic panel with the three strakes at the bottom edge of the tank, particularly, feels flimsy to the touch. The gap between this panel and the tank lowers the quality perception. The bikini fairing looks okay and Honda could have made the motorcycle more distinctive. The issue with personable styling is that there will be some people who won't like that personality. Tough. Finally, I'm a little disappointed with the overall finish and quality of the Unicorn 160. We expect the world from Honda on this front and it's always a surprise when the Honda in the test isn't the benchmark on the finish and build fronts. Unfortunately for the Honda, Suzuki have nailed the finish and quality of not only the Gixxer but every single product they've brought to India so far. 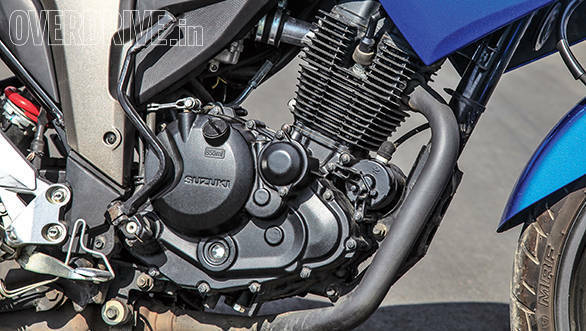 Up close, the Gixxer can look like there's a lot going on and there might even be a reasonable apprehension that too many elements remind you strongly of the Yamaha FZ. 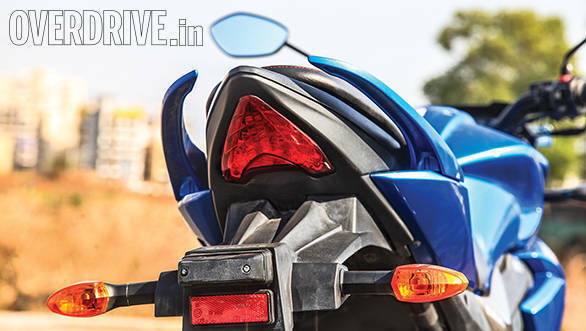 But as a whole, the Gixxer looks cohesively like a youthful, sharp motorcycle of great quality and finish. 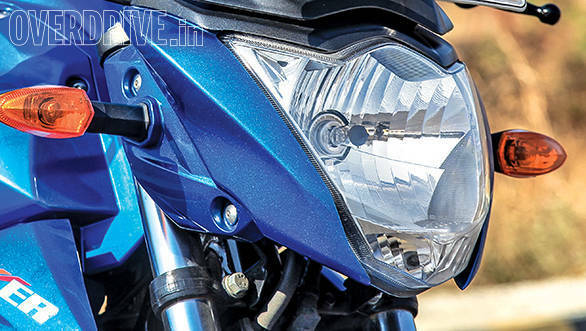 As I've noted before, the head light design is a bit simple and I was afraid that the Gixxer wouldn't get eyeballs. But as I've repeatedly seen, the opposite actually happens. On design, finish and quality, the Gixxer remains the top 150, then. Let's take the newer engine first. 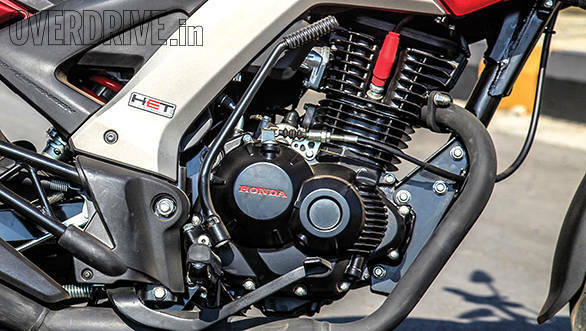 Honda say the 163cc engine is based on the older 149cc but is all-new and now, counterbalanced. The increased displacement comes from a longer stroke. The engine also gets a larger bore carburettor which feeds the higher compression motor (up to 10:1 now) via higher lift valves. Down below, the flywheel is slightly lighter and needle bearings are employed to reduce friction. Honda chose not to mess with the gearing but the Unicorn has been sprocketed to run a slightly taller overall gearing. 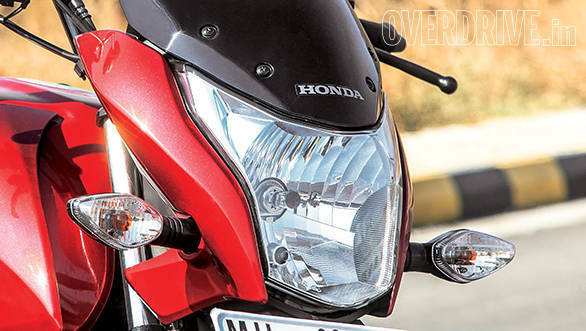 The net result is a smooth engine that has that assured sense of refinement we expect from Honda. Compared to the old 149cc engine, the new motor makes torque slightly higher in the rev range. Power has also gone up but crucially, it arrives earlier. 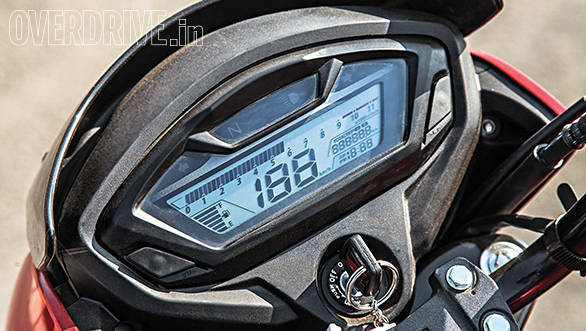 What that means is effortless, gutsy performance that makes the Unicorn 160 a terrific commuter. Whether you like to ride the wave of torque quietly or like the engine to buzz it up a bit, the Unicorn is up for it. Numerically, the Honda makes more torque than the Gixxer though they both have roughly the same peak power. They also weigh the same. The difference then comes primarily from how they make their power and their gearing. The Unicorn is geared lower and fifth is noticeably a higher ratio. The Gixxer has a more even spread that gives it a lower fifth gear. In traffic, there's not much in it but against the stop watch, the Honda is a full half second ahead at 60kmph. But at 100kmph, they're neck to neck. Held flat out, the Gixxer will push to about 3.5kmph faster than the Unicorn 160. Yeah, there's not much in it. The difference lies in the nature of the performance rather than its quantity. The Gixxer always feels slightly thrashier, slightly more brash. Like it wants to get up to some mischief. The Unicorn feels more mature, more laidback but just as fast and capable. It always feels like it's working less hard. Or like it's got a bigger set of lungs and heart. Which it does. Make no mistake, these two are the quickest 150s you can buy right now. All others feel noticeably less torquey when you ride them back to back with these. It's not even close. In terms of economy, the Honda has it nailed. It returns about 10 per cent more economy than the Gixxer in every condition and ridden right, a genuine 55kmpl in the city, in the real world is possible. Impressive. Who wins? It's annoyingly close. I'm torn between the sweet refinement of the Honda and the naughty gleam in the Gixxer's eye. I'm going to call this a tie. Once again, Honda chose to retain the essential geometry of the Unicorn and created a new chassis so that superfluous material could be shaved to create a lighter platform. This works well. Like the old Unicorn, the 160 is also a centred, assured machine that responds smoothly and calmly to your demands. Hard cornering, flicking through traffic or just ambling about casually is all handled with impressive ease. Ride quality is strongly reminiscent of the old Unicorn. Your initial impression is that the 160 is stiffer than the Gixxer. As time passes you become aware of the tight wheel control of the Unicorn. There are plusher bikes than this and stiffer bikes than this, but the Unicorn's balance between damping and absorption is pretty impressive. Braking again is extremely direct and easy to use. As much as the CBS system works well to make up for the lack of new riders' skills, I think Honda should move the game on. The CBS model is about Rs 6,000 dearer. ABS instead of CBS would make the bike, by my estimate, another Rs 4,000 more expensive. And I think that's the better deal. CBS works, but ABS is better. The Gixxer doesn't have ABS, CBS or indeed variants, but is as effortless a motorcycle as the Unicorn. Once again, the difference is in the temperament. The Suzuki revels in its youthful enthusiasm. It really likes to corner hard and where the Honda gives you great confidence, the Gixxer does all that and then pats you on the back for the good time it is having. But when you push on ever harder, you'll realise that the one area where the Gixxer is dramatically ahead of the Unicorn is the tyres. The Gixxer gets a radial at the back and stickier tyres than the Unicorn. That makes it a much more trustworthy plaything in iffy conditions and when you're red misting. The Gixxer rides a bit softer than the Honda overall and I like this. It means the Gixxer jitters less over bumpy stretches than the Honda and generally feels more plush. The flip side is that the Honda's feel changes very little with a pillion but the Suzuki will feel the pillion noticeably more. In braking, the Suzuki cannot match the assurance of CBS in inexperienced hands but bring a little skill to the table and results are close enough. Who wins? I really like the Unicorn's sense of stolid, unwavering ability but I enjoyed the younger tone of the Gixxer just a bit more so by the narrowest of margins, I'm going to give the Suzuki 0.0003 extra points. Let's be clear about this. 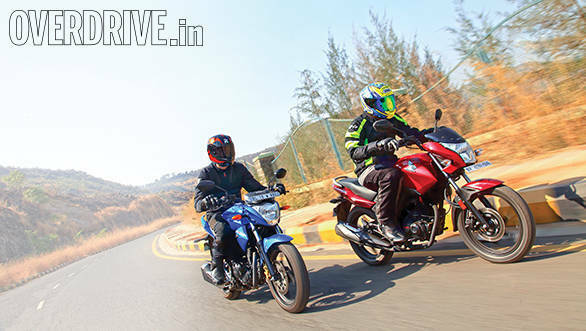 Bikes like the Pulsar 150 DTS-i and the Apache RTR 160 are now the really old men of this arena. You can be sure their replacements are coming and soon. 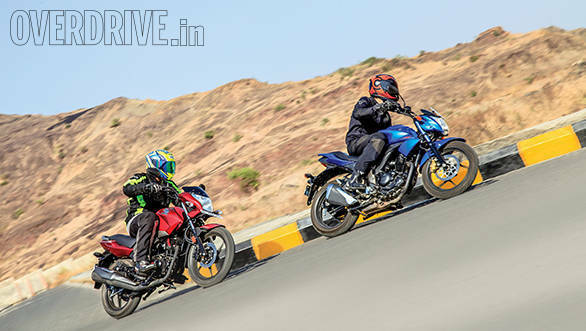 In the meantime, the Yamaha FZ V2 has taken a slight step backwards and that leaves the Suzuki Gixxer and the Honda CB Unicorn 160 as the two bikes that really stand out. And while you can, in theory, buy the older models of each of those three bikes, you really shouldn't bother. They're not even in this performance ballpark anymore. If you leave the CBS model's price out of this, the Honda is Rs 1,000 cheaper to buy in Mumbai so the decision isn't a money thing either. My personal pick of the two is the Suzuki Gixxer. I like its energy and its personality and every time I ride it, it makes me want to ride it more and harder. And crucially not want to ride anything of similar size. But the Unicorn is not second here. It's first and a bit. I like the way Honda have worked hard at retaining all the things that make the Unicorn such a steady seller in the segment. It retains that sense of gravity and maturity while bringing to the table a lot more power as well as economy. It makes you wonder how the battle would be if (when?) 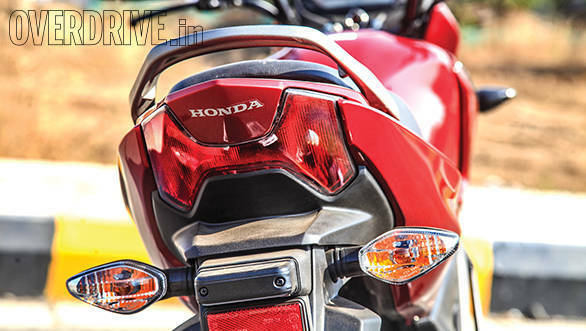 Honda decide to actually target the youthful end of the 150cc space. Oooooh, can't hardly wait.